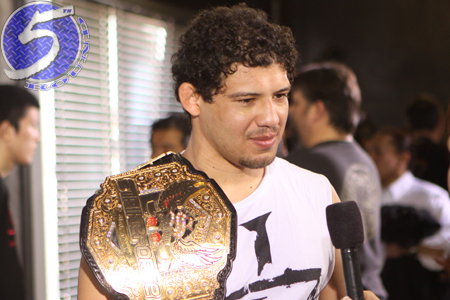 Over the weekend, the rumor mill had suggested a fourth tango between Strikeforce lightweight king Gilbert Melendez (Pictured) and Josh Thomson was in the works. Thankfully, Strikeforce CEO Scott Coker quickly killed that chatter on Saturday night by claiming Pat Healy likely punched his top contender ticket by beating DEEP champion Mizuto Hirota. “Healy definitely increased his stock. I think that we’re going to go back and talk to [Strikeforce matchmaker Sean Shelby], but I think that you will see that fight, but it’s not confirmed yet,” Coker expressed at the ‘Strikeforce: Rockhold vs. Kennedy post-fight presser. Although Coker wasn’t prepared to write Healy’s name down in pen as Melendez’s next opponent, the Team Quest-trained fighter believes he’s the best available man for the job. Melendez owns an impressive 21-2 professional record and has rattled off seven consecutive victories. The 30-year-old is considered by most pundits as the planet’s top lightweight not competing in the UFC. Healy is anxious for his opportunity to knock “El Niño” off his pedestal.